Following up on their 2016 collaboration “La Bayadère”, Niigata-based Noism and the Shizuoka Performing Arts Center (SPAC) have joined hands again. 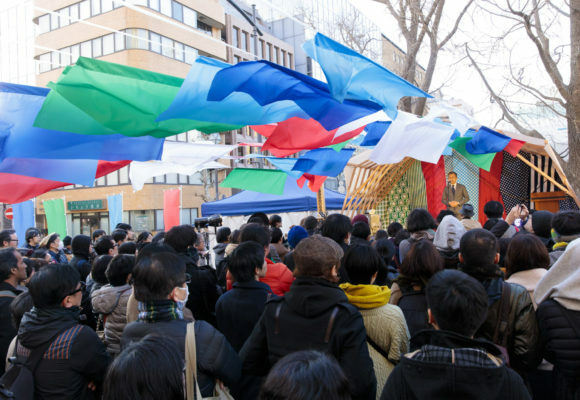 This time, almost as many Noism dancers as SPAC actors are participating. 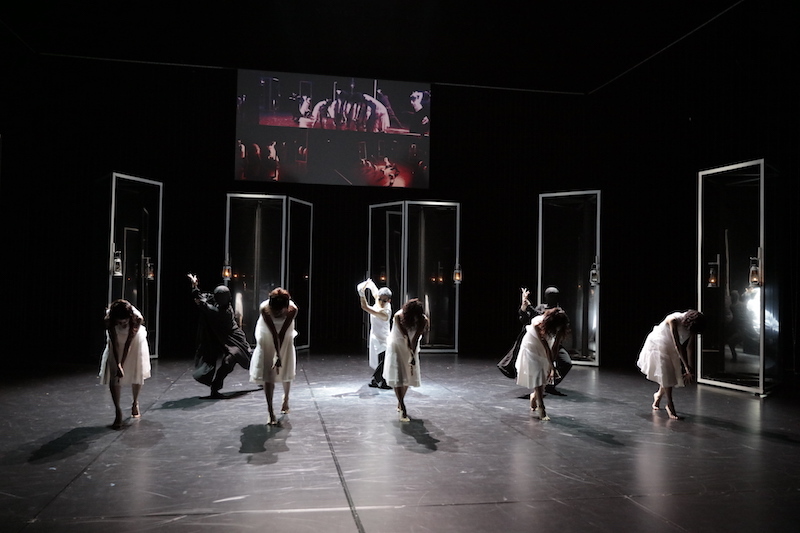 While they are using Prokofiev’s music and a Shakespeare text, this isn’t your average fusion of dance and theater – it is what Jo Kanamori calls “dramatic dance”. Words and movement are used not simply to explain the story. Instead, you might venture that the three elements of story, words, and dance make progress autonomously. 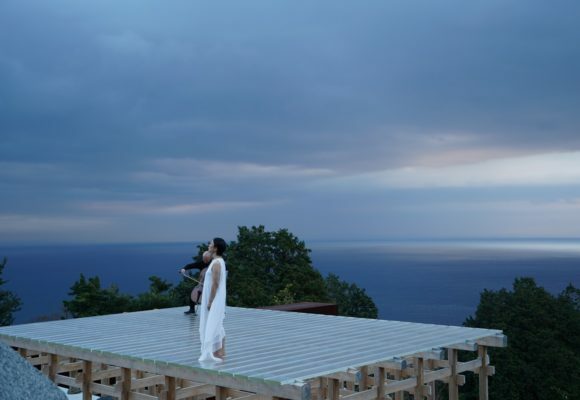 As this style varies by the work performed, it is difficult to delineate it clearly, but just as what Pina Bausch’s Tanztheater referred to remained fluid, Kanamori is always on the hunt for new forms. The first surprise is that as the title suggests, there are several “Juliets”. Five Noism dancers come together to dance as Juliet. You can hardly tell them apart, perhaps because their faces are not clearly visible, making them appear like particles in motion. 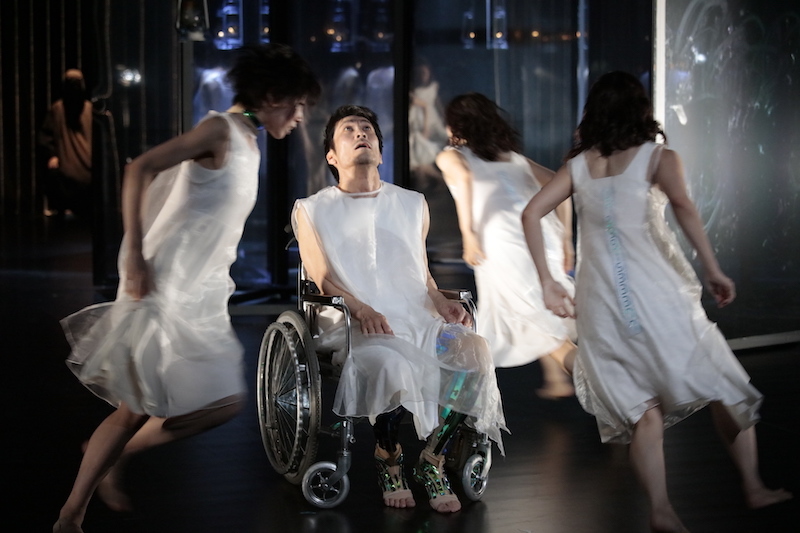 In contrast, Romeo, played by SPAC’s Morimasa Takeishi, is abundantly self-aware of his persona, but is limited in his movement due to being stuck in a wheelchair. The Juliets, who have only their movement, and Romeo, who speaks while discarding motion, confront each other. As the Juliets cannot answer Romeo’s calls verbally, the voice is lost in their movement. Sometimes they appear to be controlled by the voice’s power, but in the next moment it seems like they easily escape its grip and sprint away. This constant, tense relationship grows more and more frightening as the play goes on. Another reason for the growing tension is the somehow disquieting movement of Sawako Iseki on the side. Iseki’s role is apparently that of Rosaline, a woman Romeo was in love with before he knew Juliet, but this character does not appear in the original play. While supposedly a minor character, her dancing creates distinct, powerful lines that leave a mark – you’ll actually find out what they mean at the end. Kanamori himself appears as Friar Laurence, moving with a heavy gait filled with an enigmatic force. His is a peculiar appearance, a fixed point for inspiring movement in everyone else, a core being concealing all movement and possessing fearsome power. Both the performers’ all-white costumes and the stage sets exude an uncorrupted beauty at times, while giving away a suffocating sense of being exposed to an inescapable light at others. It seems like the story takes place in a hospital. To paraphrase Shakespeare: “All the world’s a hospital, and all the men and women merely patients.” Kanamori is trying to give his piece perspectives that include even the oppressive. A terrible abyss awaits right next to a beautiful movement. You really feel the hopes of the Juliets, who continue their endless escape like particles unleashed into the world. 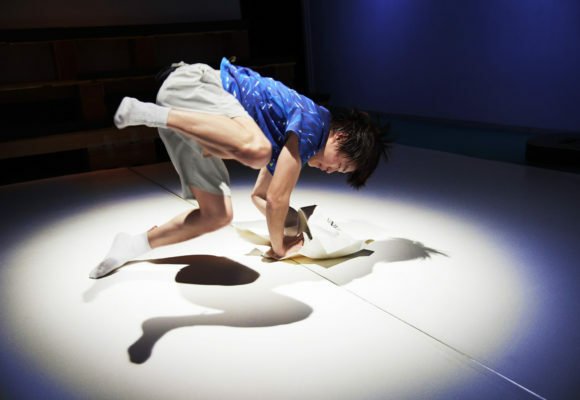 “Dramatic dance” is coming ever closer to truly embodying Jo Kanamori’s inner world. Noism1×SPAC Dramatic dance vol.4 "ROMEO＆JULIETS"
Music: Sergei Prokofiev "Romeo and Juliet"
The original work: William Shakespeare "Romeo and Juliet"